The Brooklyn Robins (also known as the Dodgers and Superbas) played a four-game series against the Boston Braves at Braves Field beginning June 29, 1918. The Braves won two of the first three games. Two thousand fans attended the fourth game, on Tuesday, July 2. This one promised to be a pitchers’ duel. Burleigh Grimes of the Robins was facing Dana Fillingim of the Braves. Both pitchers were impressive 24-year-old right-handers who could throw the spitball. Grimes had a 5-1 record and a 0.79 ERA in his eight most recent starts. Fillingim boasted a season mark of 7-3 with a league-leading 1.42 ERA. The July 2 game was scoreless through the first four innings, as the spitballers worked their magic. 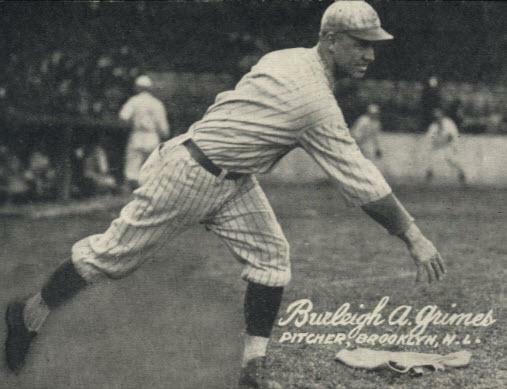 With two outs in the top of the fifth, Brooklyn’s Mack Wheat (brother of Zack Wheat) dropped a bloop double between first baseman Ed Konetchy and right fielder Al Wickland. He advanced to third base on a wild pitch by Fillingim and scored on Grimes’s single to right field for the first run of the game. The Braves threatened in the bottom of the fifth but failed to score. Konetchy led off with “a rousing double to deep left centre” and moved to third base on a passed ball.7 But Art Wilson’s grounder was snared by third baseman Ollie O’Mara, and Konetchy was tagged in a rundown between third and home. The sixth and seventh innings were scoreless as the pitchers continued to duel. Grimes led off the top of the eighth with a single to right field. Jimmy Johnston laid down a sacrifice bunt; catcher Wilson retrieved it and threw to Konetchy at first for the out. Grimes rounded second on the play, so Konetchy threw behind him, to shortstop Johnny Rawlings covering the bag. Caught in a rundown between second and third, Grimes managed to return safely to second when he was hit by a relay from third baseman Jimmy Smith. It was a break for the Robins. Grimes reached third on an infield out and scored on Jake Daubert’s single to right field. Trailing 2-0, the Braves got singles from Kelly and Wilson to start the bottom of the eighth. Rookie Red Massey, pinch-hitting for Fillingim, attempted a sacrifice bunt but popped the ball up near the third-base line. Grimes raced over and made a spectacular catch, and then threw to second base to double up Kelly. It was a sensational play and doused the Braves’ opportunity. Braves pitcher Art Nehf entered the game in the top of the ninth. O’Mara greeted him with a single to left field. Mickey Doolin sacrificed and Wheat reached on an infield hit. Nehf threw to first to pick off Wheat, but Konetchy dropped the throw. O’Mara raced home as Konetchy threw wildly to the plate. It was quite a day for Grimes. Though he entered the action with a .118 batting average (4-for-34), he singled in the ninth inning for his third hit of the game. Brooklyn tallied another run when Wheat scored on Johnston’s groundout. Grimes retired the Braves in order in the bottom of the ninth to complete a four-hit shutout. The final score was Brooklyn Robins 4, Boston Braves 0. 1 Scientific American, August 16, 1919. 3 Baltimore Sun, July 3, 1918. 4 Boston Globe, June 28, 1918. 5 Brooklyn Daily Eagle, July 3, 1918. 7 Boston Post, July 3, 1918. 8 Washington Post, July 4, 1918.